formerly Caber Feidh, Los Angeles, USA. Fanø Pipes and Drums, Denmark. 1066 Pipes and Drums, Hastings. the First Regiment of Foot. Tasmania Police Pipe Band, Australia. DM since 1998. Monkstown Mossley Pipe Band, Belfast. DM since 1988. Cameron Highlanders of San Diego, USA. DM since 1983. Clan Donald Pipes & Drums, Green Bay, Wisconsin, USA. 49th Field Regiment Pipes & Drums, Sault Ste. Marie, Ontario, Canada. DM, Tutor & Visual Technician. London Scottish 1990-2002. Senior DM The London Regt. 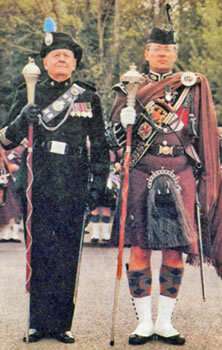 Jim Powell, the London Irish Rifles, and son Mickey Powell, the London Scottish Regt, shortly before the amalgamation of the two regiments with the Princess of Wales Royal Regt to form the London Regt.